Remember that time I made Sticky Sriracha Meatballs? Well, that wasn’t enough; I couldn’t stop there. I needed to turn the flavours from that addictive finger food into something I could actually devour as a full blown meal – and on the regular. I don’t always have time to make homemade meatballs – but I often have time for chicken and rice! I took the sauce recipe from the Sticky Sriracha Meatballs and tossed some sliced up chicken in there. I like to use boneless/skinless chicken thighs because the meat is so tender and omnomnom. You can definitely use boneless/skinless chicken breasts, though I highly suggest the thighs. I couldn’t think of a more fitting companion to this chicken than my simple coconut lime rice. Honestly, all you do is cook your rice in coconut milk and lime juice, then toss in some lime zest at the end. It doesn’t even need to be seasoned! The coconut and lime flavours are soft and pair perfectly with this chicken’s KAPOW (please envision that KAPOW with a dramatic comic book bubble and shrill trumpets blaring madly). In a large bowl, toss the chicken thighs in sesame oil. Place the chicken thighs in a baking dish (I always add a splash of warm water to my baking dish to keep the moisture around). Cover with foil and bake for approx. 20 minutes or until the chicken has an internal temperature of 165 degrees F and the juices are running clear. RICECook as per instructions on package (with coconut milk and the juice of one lime in place of water). Once ready, toss in the lime zest. SAUCEHeat a large saucepan on medium heat. Combine all of the sauce ingredients in the saucepan and stir to combine. Bring to a simmer, then bring heat to low and stir regularly. Once the chicken is ready, slice and place into the saucepan with the sauce. Toss to coat all of the chicken. Serve the chicken on a bed of the coconut lime rice. Your dish sounds amazing, we always have a bottle of Sriracha in the fridge. Wow, this looks SO tasty! 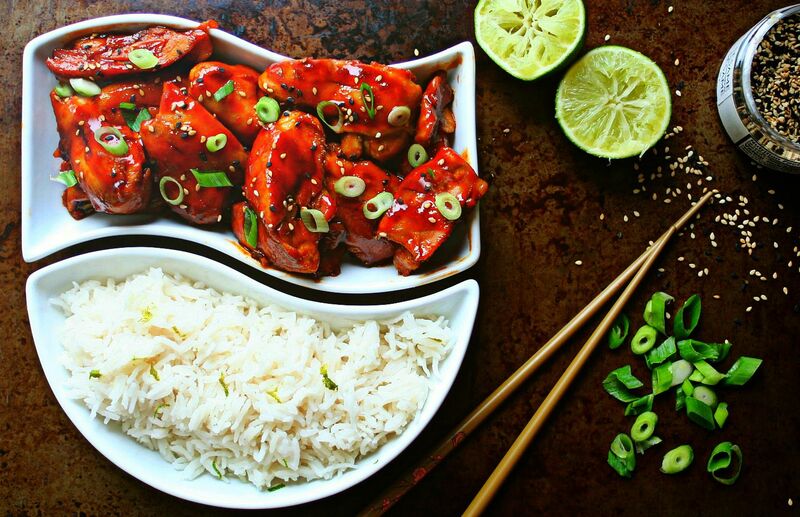 Sriracha is one of my favourite ingredients to coo with -- can't wait to try this! Thanks, Alanna! I agree - I could never get enough Sriracha and I could never tire of Sriracha recipes. I hope you love this dish as much as I do once you try it! This looks so good! I'm definitely putting this on my meal plan for this week, although I'll have to tone down the Sriracha for my kiddos :) Thanks for posting this!